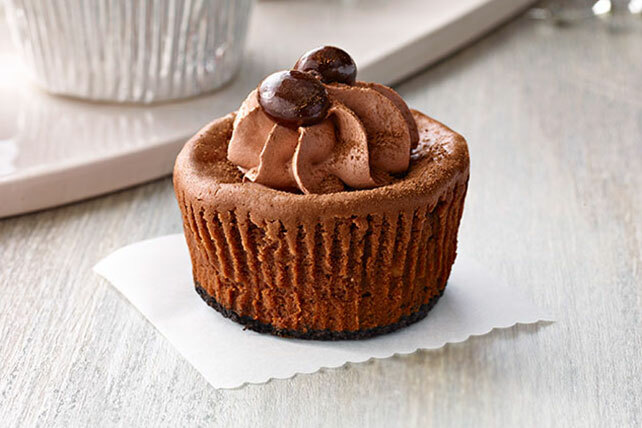 Take a bite of these decadent Mocha Cheesecake Minis and serve at your next holiday party. You'll love the hints of chocolate and coffee in this mocha cheesecake, all topped with some whipped topping for a delicious dessert you don't have to share. Mix cookie crumbs and butter; press about 1 Tbsp. onto bottom of each of 12 foil-lined muffin cups. Bake 8 min. Bake 23 to 25 min. or until centers are almost set. Cool completely. Add 1 tsp. cocoa powder to COOL WHIP; stir gently until blended. Spoon into pastry bag fitted with decorating tip; use to pipe COOL WHIP mixture onto cheesecakes. Garnish with remaining cocoa powder and coffee beans. Insert decorating tip into empty pastry bag. Fold down top of bag about halfway to make cuff; fill with COOL WHIP mixture. Unfold cuffed top and twist bag until it's tight against the COOL WHIP mixture. To pipe, hold bag firmly and squeeze from the top, keeping bag twisted closed to prevent leaking from the top of bag. If you don't have a pastry bag, you can use a resealable plastic food bag instead. Fill bag with COOL WHIP mixture, then cut piece off one bottom corner of bag and use to pipe COOL WHIP mixture onto cheesecakes.